REGINA, Jan. 30, 2017 /CNW/ - Input Capital Corp. ("Input") (TSX Venture: INP) (US: INPCF) will release fiscal its FY2017 Q1 results after market close on Tuesday, February 7, 2017. 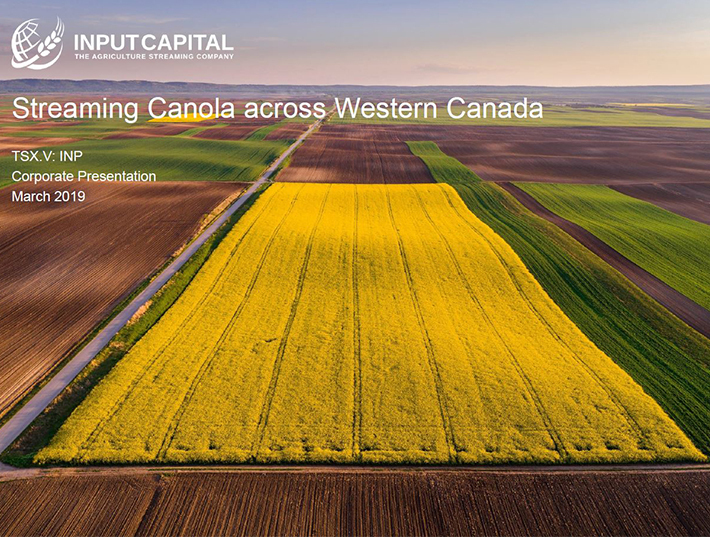 Input is an agriculture commodity streaming company with a focus on canola, the largest and most profitable crop in Canadian agriculture. Input enters into multi-year canola streaming contracts with canola farmers in western Canada. Pursuant to the streaming contract, Input pre-purchases a fixed volume of canola to be produced over the life of the contract. Input is a non-operating farming company with a diversified portfolio of canola streams, all of which produce canola and revenue for Input within a year of being signed. Input is focused on farmers with quality production profiles, excellent yield potential, and strong management teams.